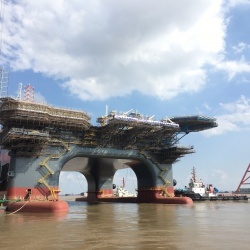 At 5pm on September 27th, the OOS Serooskerke was successfully undocked from CMHI (Jiangsu) dry dock. The undocking operation was complex because of the limited water depth in the dry dock. The close comradery between CMHI and OOS proved to be a winning formula to devising an efficient and safe method to undock the vessel.